Do you want to be a guardian home? Why settle for a standard poodle when you can have an Exceptional Poodle! Miss Maisy is doing absolutely amazing. We have totally fallen in love with this happy, smart and funny girl! Our groomer loves her, our dog trainers are very impressed with her and she is fitting in with the rest of the pack wonderfully. I have taken her to work and she has been calm, inquisitive and friendly. Housebreaking was a piece of cake for her. She has learned to use the doggie door and love playing in the yard with the other dogs. I think this has been one of the easiest pups we have ever had. Thank you for giving her such a great start in life! I'm so happy with Ada, my 11 month old girl. She's smart, savvy, athletic and stunning! She's done great in the conformation show ring and is a natural in agility. More than that, I love Karen's home and the wonderful thought and planning that she's put into creating her incredible setup for raising puppies! From a very young age the puppies are given loving socialization by Karen and kind visitors, are groomed regularly, Ada came to me with no vices or fear about being groomed. They are constantly being given new toys and have a play area as well as a deluxe whelping nest, stimulation as well as personality testing to ensure that pups are placed with the right families. I highly recommend Winterswind Poodles and would definitely get another. I am 100% satisfied with Karen Winters and my treasure, Ramone. Please know that if you get one of her puppies, you are guaranteed a well thought out breeding, conscientious and responsible. She runs Volhard testing on all litters and is an advocate for her dogs giving back thru service work. Karen has been responsive to questions, inquiries are welcomed. They always say it's a good sign if you would buy the same car again if you had it to do over. I would purchase my pup over and over. Thank you Karen. 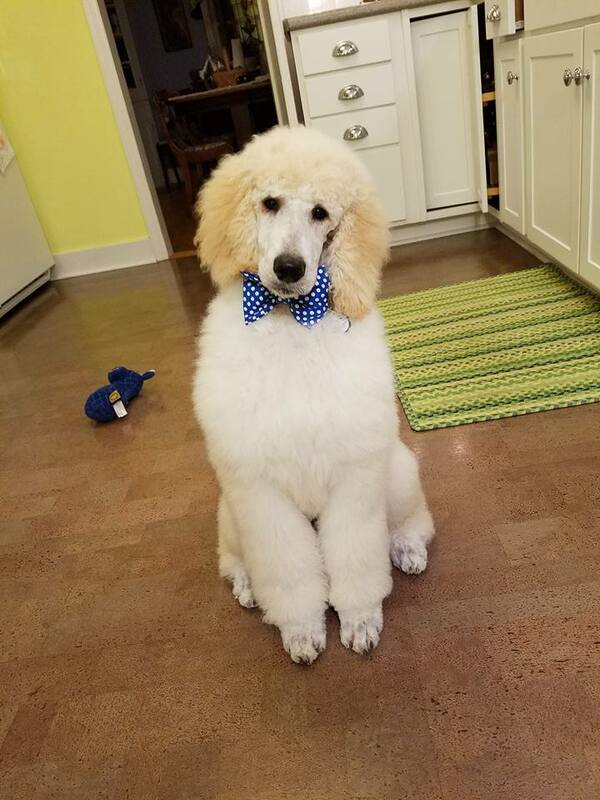 If you are looking for an amazing puppy from an equally amazing breeder, Karen Winters, owner of Winters Wind Standard Poodles, is who you want to meet. Karen is passionate about maintaining a quality line of standard poodles. Her puppies have excellent lines, most from Champion or Grand Champion parents. Her adult dogs are health tested to make sure the puppy you bring into your home is as genetically as healthy as possible. Karen is always available to answer any questions you have before and after the adoption of your new family member. I am lucky enough to be a Mom to one of Karen's babies. He is absolutely the sweetest, most loveable boy I could wish for. He is extremely smart and always willing to please. Winnters Wind Lavender's King Louis, or Louie for short is my lovebug and I would be lost without him. He stole a piece of my heart the minute I saw him. Thank you, Karen Winters. Our beautiful Winters Wind PAD Olympia's Flame has been such a blessing to Phoenix Assistance Dogs of Central PA. Working with Karen has been nothing less than stellar from day one. She is knowledgable and pleasant and we have been extremely happy with our puppy! Best Poodle experience for us as a program! I have know Karen and Rob for several years and have always been amazed at the beautiful poodles they raise. This year I was honored in being able to own one. My beautiful Miss Judy has almost completed her service dog training and will be my ‘ears’.. Waking me with the alarm, letting me know when someone is at the door, alerting me to smoke alarms and also to sirens both at home and in the car. Karen has made herself available to answer questions and give advise I have needed on keeping Judy happy and healthy. 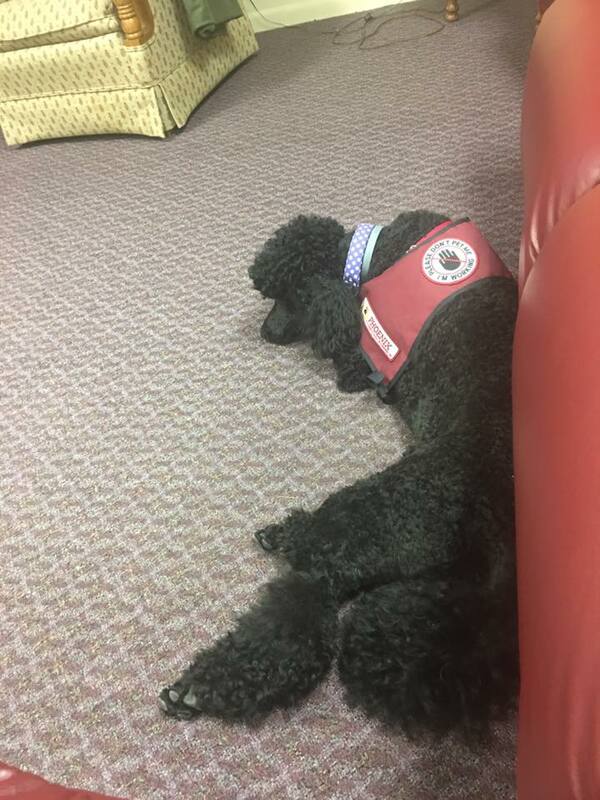 Thank you Karen and Rob … Winters Wind Standard Poodles! My husband and I had been talking about getting a puppy for a long time, and I spent weeks researching breeders all around the country and Canada. WintersWind Poodles impressed me above all others, and Karen was unbelievably helpful in answering A LOT of questions, sending me videos, and holding on to the pup until we were back from a trip. Tashi puppy has been a pleasure since the moment he arrived. Karen really does breed for temperament, looks, health – people constantly “ooohh” and “ahhhhh” because he is so stunning in the way he moves and is structured. Just today, someone said, “that must be a show dog!” As far as personality, he is friendly, outgoing, funny, cuddly, affectionate, and so very smart – he makes things very easy for me, as a first-time dog owner. Even now, when he is almost 8 months old, I have contacted Karen for a few Tashi questions and she gets right back to me. I really feel supported by Karen – that she will always be part of Tashi’s (and by extension, our) family. My husband said that in a year or two he would also like a female poodle, and there is no question that we would only consider Winters Winds poodles. Thank you, thank you for our wonderful boy!